Designed specifically to defend the industrial athlete against arc flash hazards. A NFPA 70E Hazard Risk Category 2 product line, CarbonX Arc is constructed to be truly non-flammable, with a patented high-performance fiber blend designed specifically to defend against arc flash hazards. Lightweight, soft to the touch, and comfortable next to skin, CarbonX Arc exceeds the standard levels of protection required by NFPA 70E and NFPA 2112, with an ATPV rating of 9.4 and a TTP rating of 10.7. CarbonX meets all No Melt, No Drip requirements for flame-resistant PPE. 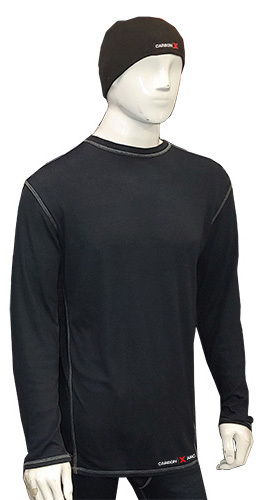 CarbonX Arc solutions include: long-sleeve tops and full-length bottoms. Available in blue.